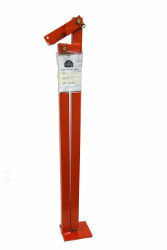 A post puller designed to easily remove studded “T” type posts from the ground with one person operation, allowing reuse of posts. Can also be used with a hook to be used for other post types. 33" upright on a 5" x 5" platform with 35" handle.